My 10-year old son and I made this cute snowman ornament / gift topper in a couple of hours. We had a great time together and it was fun teaching him a few simple sewing stitches. We used left over craft items we had around the house and did not have to purchase anything new. Hobby Lobby and Michael’s both sell sheets of felt for around .20 cents each! 1. Make a pattern for your snowman and for the hat on cardstock. Cut out and trace onto felt. Cut out felt pieces. 2. We put the hat together first (we cheated a bit and only made the hat one-sided but you could make it double-side to hide stitches on the back.) We used a whipstitch to attach the stripes to the hat and the hat to the snowman. For younger children, the hat, nose and eyes could be glued on with craft glue. 3. Then we created the face, it is important to remember to do this before you sew the snowman body together! We used an outline stitch for the mouth. You could also cut the mouth out from black felt and glue it on for younger children. We used sequins for the eyes, you could also use a french knot. 4. For the body, we used a blanket stitch. Remember to leave a hole to stuff the snowman or stuff as you go. We used cotton balls because we had a big bag at home but you could also use polyester fiber fill. 5. We cut a long strip of felt and simply tied it around the snowman’s neck for a scarf but any ribbon would work. For the hanger, we used left-over gold thread from one of last year’s Christmas crafts. You can glue or sew the ribbon to the top of the hat. 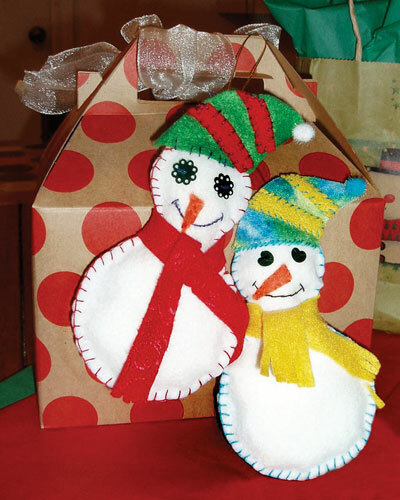 We found this fun craft at http://www.bhg.com/holidays/christmas/crafts/fun-felt-snowmen-decoration-for-christmas. They have patterns and details on the embroidery stitches online.